Chapter 13 bankruptcy typically applies to individuals who have enough money to pay their living expenses, but not enough income to completely/promptly pay other outstanding debts. In general, Chapter 13 is a repayment plan in which an individual agrees to pay creditors part or all of their debt over a 3-5 year period. The individual is allowed to keep their property as long as they make all the payments according to the plan. Upon completion of the repayment plan, the debts addressed by the plan are discharged and the debtor has no further obligation to pay them. Therefore, often times, much of the individual’s debt is forgiven provided they successfully complete their Chapter 13 plan. Ms. Ellis finds many individuals choose to file a Chapter 13 even if they make under the means test. These are individuals who make under the means test but wish to keep personal or real property above the Florida Exemptions allowed by law. For Example, an individual may want to keep $10,000.00 of furniture, jewelry, vehicles, etc. A common reason for a person to file a Chapter 13 even though they make under the means test is because they have a vehicle they want to keep that is paid in full but over what Florida Exemptions allow. Those individuals may file a Chapter 13 and retain that vehicle, furniture, jewelry, etc by filing a Chapter 13 and making a modest monthly payment to a U.S. Chapter 13 Trustee for 36 months or 60 months. The biggest misconception regarding Chapter 13 is that the debtor must pay back all his or her debt. This is usually not the case. In general, the debtor pays back a portion of their debt depending on their Income, Expenses and/or assets they want to keep. Note that Chapter 13 Bankruptcy is more complex than Chapter 7 bankruptcy. 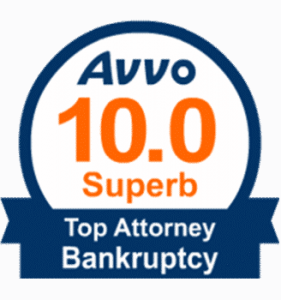 As a result, the use of an experienced bankruptcy attorney is highly recommended for anyone considering a Chapter 13 filing. If you have any additional questions regarding filing for Chapter 13 bankruptcy in Sarasota, Bradenton, Venice, Nokomis, Englewood, Port Charlotte, Myakka City or the surrounding areas, please feel free to contact Ms. Ellis for a free consultation. Many debtors choose to file for a Chapter 13 bankruptcy because they are unable to pass the Means Test. Simply put, their income and/or assets are too great to qualify for a Chapter 7 bankruptcy. • A debtor has liens that exceed the value of the collateral/assets (for example, the remaining debt on a car loan exceeds the market value of the car). The general benefit of Chapter 13 bankruptcy is that is allows a debtor to repay existing debt without incurring additional fees/interest, while allowing him to retain all of his personal property. There is also a convenience benefit, as the debtor only has to write a single monthly payment to the bankruptcy trustee to repay his debts. Most debtors fill out a form allowing the Trustees Office to deduct that check from their checking account once a month. The U.S. Trustees Office receives a small percentage for distributing your payment to the creditors. To review Frequently Asked Questions on the Chapter 13 U.S. Trustee Web Site click here. Under Chapter 13, a commonly used benefit is catching up on overdue house and car payments without additional interest or penalty. This is done by spreading out the past due payments over the life of the bankruptcy repayment plan (3-5 years). Another powerful feature of Chapter 13 bankruptcy is that it can remove a significant amount of debt from a lien. For example, if a debtor has a car loan with a balance of $15,000, and the car’s current market/sale value is only $12,000, the Chapter 13 filing could eliminate the difference of $3,000 from the loan balance. In this case, the debtor would only have to pay $12,000 over the life of the repayment plan. There are many potential tax benefits under Chapter 13, but the clearest advantage is that it allows a debtor to pay off taxes without an interest penalty in some cases. In some cases, taxes and penalties can be completely discharged. You should consult a bankruptcy lawyer if you wish to explore the tax advantages that apply to your specific circumstance within the Chapter 13 bankruptcy code. UPDATE: Recent changes have allowed individuals to file a Chapter 13 Bankruptcy and file a motion requesting the Judge to strip any liens on their homestead property that follow the First Mortgage provided the First Mortgage covers the value of the homestead at the time of filing. Note this is for Homestead Property and individuals who file a Chapter 13. For more information: Click here. At the conclusion of the Chapter 13 repayment plan, any outstanding debts addressed by the plan are discharged. The debtor has no further obligation to pay the discharged debts, and by law, the creditor cannot seek additional payment. Recall that Chapter 13 is more forgiving than Chapter 7 bankruptcy, as Chapter 13 can discharge some debts that Chapter 7 cannot discharge. Click here to view the list of debts that may be discharged under Chapter 13, but not under Chapter 7. How much will I pay in a Chapter 13 bankruptcy? This is a common and important question. Under Chapter 13, a debtor’s repayment plan must account for secured debts (debts tied to collateral such as a home or car), the bankruptcy trustee’s commission and possibly attorney fees. In addition, the debtor is responsible for paying all or a portion of unsecured debts. The amount that must be repaid is defined by the greatest of the following three values: the total value of priority claims, the Best Interest of Creditors number or the Best Efforts number. The most common priority claims are: unpaid child or spousal support, recent taxes and administrative expenses associated with the bankruptcy filing. The Best Interest of Creditors number is essentially the amount of money that creditors would receive if the bankruptcy was filed as a Chapter 7 case. The Best Efforts number is a determination of the debtor’s disposable income (calculated in accordance with the bankruptcy code) over the life of the repayment plan. If you have any additional questions about filing for Chapter 13 bankruptcy in Sarasota, Bradenton, Venice, Nokomis, Englewood, Port Charlotte. Myakka City or the surrounding areas, please feel free to contact Ms. Ellis for a free consultation.